It’s annoying when you have to leave your personal items at the airport. Without these products, you can’t follow your grooming and personal hygiene checklist. No matter how much you need your personal hygiene items, the security officer will tell you that these items are restricted on the board of a plane. You’ll have to take them out of your carry-on bag and leave at the airport. It’s sad when you realize that you could prevent this if you did your airplane travel research. You could visit U.S. Transportation Security Administration during travel to check which items are banned to carry on the plane. Bellow, you’ll find what you need to know when you plan a travel with an airline. What size should be your travel bag. What personal hygiene items you are allowed to take in your carry-on bag. While checking-in for the flight, the airline operator asks for your passport and air tickets. After that, he checks your identity in their database and asks for your luggage. Next, you need to pass over a scanner where the airport police check you for prohibited items on board a plane. Should not carry on board the plane banned items. This is the type of baggage you can take with you on a board of a plane, also known as “hand baggage” or “cabin baggage”. The carry-on bag should not exceed the following size dimensions: 22” in length, 18” in width, and depth of 10”. On the weight, the carry-on bag should not be heavier than 22 lbs. For more exact information on carry-on bags, check the website of your airline. 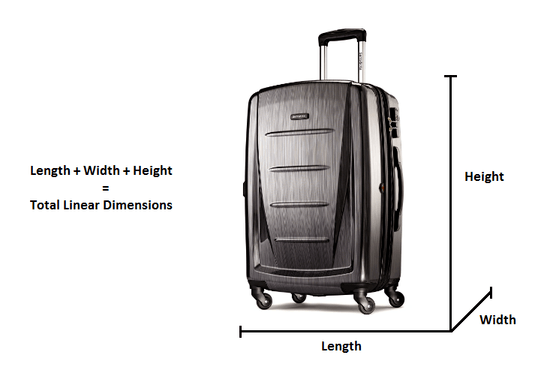 Legal dimensions for the carry-on bag by American Airlines? This is the larger and heavier type of baggage. It is handed over at the check-in desk of your airline in the airport and is then transported in the plane’s cargo area. The average weight and dimensions by American Airlines are 62 inches for maximum dimensions and 50 lbs for maximum weight. Additional fees apply when the checked luggage weight or size exceeds the standards. Check the TSA regulations regarding items and personal hygiene products on a plane in the list below. When traveling with an infant or toddler: baby formula and food, breast milk, and juice in reasonable quantities exceeding 3 oz. (Recently, the TSA has amended this rule to allow you to carry on baby formula even if you are nottraveling with an infant. These items should be separated from your zip-top bag, and they must be declared for inspection at the security checkpoint. When you plan your next travel, flight make sure to visit your airline’s website to informed about the allowed weight and size of the luggage. This will save you time when you’ll be packing your baggage and you’ll confidently pass over the security check knowing that your luggage is legal.